This white-breasted nuthatch moves head-first down a tree as easily as it moves straight up. It doesn't fall off because it grips the bark tightly with its long toes and sharp claws. When you see a bird moving head-first down a tree trunk, you know you've spotted a nuthatch. Winter or summer, spring or fall, white-breasted nuthatches (Sitta carolinensis) are among our most reliable birds. You'll find these nuthatches in the woods and at bird feeders. They are year-round residents of this area, and pairs spend their lives in territories they have established here. In their travels up and down tree trunks and branches, nuthatches search for insects and spiders during the warmer months. In winter, they dig out dormant insects hidden away under bark or in crevices, but their winter diet is mainly vegetarian. They eat nuts, such as acorns, beech nuts, and hickory nuts, and seeds such as the sunflower seeds they find at bird feeders. The name nuthatch comes from these birds' habit of hammering a nut or seed with their long, sharp beak until it "hatches" open. They often wedge the nut or seed into a crack to hold it still during this operation. Nuthatches also store food for lean times. They fly off with acorns and seeds and hide them in crevices and holes throughout their territory. Sometimes they even cover the hiding places with bits of bark or moss. A single nuthatch may store hundreds of nuts and seeds, each in its own hiding place. During a winter stroll in the woods, you may notice a couple of nuthatches that have joined a small flock of chickadees and perhaps a titmouse or woodpecker. Such a mixed flock might also descend on your birdfeeder. These different insect-eating birds often forage together for food in the winter. They probably find safety in numbers as they all watch out for predators. Do these different kinds of birds compete for food on these excursions? Probably not. They tend to look for different types and sizes of food and to search in somewhat different places. 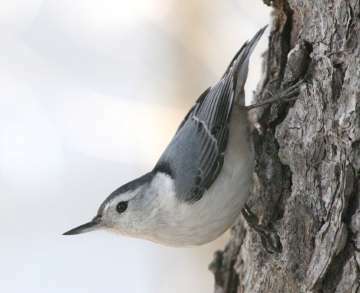 With their long bills, for example, nuthatches can reach into deeper crevices than the other birds can. Nuthatches also have a unique vantage point when they move head-first down a tree, spotting food that the other birds miss. If you have dead trees on your property, you might want to think twice before removing them. Not only do dead trees and branches provide food — a banquet of insects — for nuthatches (and woodpeckers and chickadees), but they also provide housing during the nesting season. Nuthatches usually nest in natural holes in large, dead trees. White-breasted nuthatches protect their nest holes by smearing a smelly insect around the opening to disguise their scent. They occasionally move into a hole created by another bird or into a nest box. Male and female nuthatches look very much alike, as do many other birds where both parents care for the young. Nuthatches nest between mid-April and mid-June. The female builds the nest and sits on the eggs, and the male brings food to her. Both parents feed and protect the chicks, which stay with their parents for a few weeks after they begin to fly. Besides white-breasted nuthatches, Westborough also has red-breasted nuthatches (Sitta canadensis), at least in the winter when they sometimes come to feeders. These nuthatches are smaller and slimmer than the white-breasted nuthatches. Red-breasted nuthatches have a rust-colored breast and a dark eye-stripe. Red-breasted nuthatches typically feed in spruce and fir trees, while our white-breasted nuthatches live and forage in hardwood forests, especially those with oak. Some of our red-breasted nuthatches may be winter visitors from more northern locations. Why don't white-breasted and red-breasted nuthatches fall off the tree trunks when they face downward? They have strong, short legs and long toes with sharp claws for gripping bark. They clutch the bark with one foot and balance by using the other leg as prop when they're searching for food. This arrangement works well in both directions, both up and down.